2. Big Dog proposes the setting up of a committee to investigate how Ramli had accumulated so much wealth with so little [Doing due diligence on the Dato']. The Ram vs "All the Rogues"
Ramli Yusuf, who is suing the Government + Attorney-General Gani Patail + ex-Inspector General of Police Musa Hassan + MACC + "all the rogues" (to quote Din Merican here), will have a lot of explaining to do, if documents pointing towards his assets which appear in blogs the last few days are to be used against him. 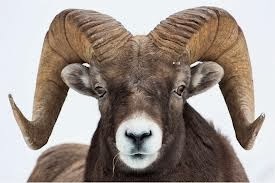 Last week, a new blog Justice for the Ram started a series of postings (FIVE so far!) apparently in support of Ramli. 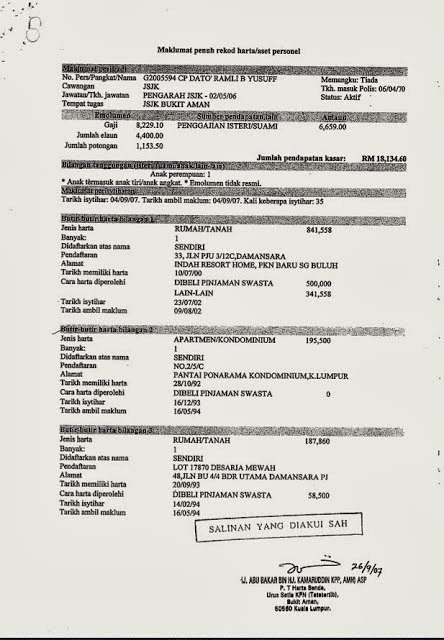 It appeared on my radar after The Benchmark, one of the few on my Blogs-That-Rock roll, reproduced 12 pages of documents which appear to be a Declaration of Asset by Ramli himself. Read Benchmark's posting Ramli Yusuf - Lebih Bersih Dari Kain Kapan. If the documents are genuine, they would suggest an amazing, even world-record-breaking, financial feat by an individual earning less than RM10k a month (RM18k plus, if combined with spouse's income). Ironically, these docs first appeared in Justice for the Ram. There are 11 more sheet$ h e r e.
I was told that our anti-graft men opened a file on these assets but never did get to close it. What or who's to stop the MACC now from finishing what it started back then? p.s. When asked about the suit, Ramli said he was doing it for the men in blue. Well, I have a suggestion. Instead of suing the Government, Ramli should conduct courses for police officers on how to accumulate great wealth with their meager income. That would really help. Tell me, Rocky, did the PM list his assets and those of his family members ? Did his son buy into listed companies ? Did Nor Yakcop declare his children's assets to allow his son to buy into a listed company ? How much are Shahreezat's children worth ? How much is Jamaluddin Jarjis' family worth ? Lu ini macam cakap tak betoi. Lu mesti tanye - siape dalam kabinet Najib ada buat decalaration ? Shahreezat ada buat tak ? Najib ada buat ? What about Nazri ? What about Nor Yakcop. These are the real filthy rich people. They buy condos, bungalows, they buy listed companies. Both my parents are retired police officer. My dad's last rank before he retired was SAC1, while my mom's was one rank higher than ASP (can't remember what...sorry!). Have never taken a bribe in their life. We live in the same terrace house for more than 30 years...my parents have NEVER owned a first hand car EVER!!! Semua second hand...cannot afford otherwise. My mom tak pernah ada savings account until she retired as she did not have any money left to save! My classmate's father, whose rank was lower than my dad's when he retired and whose wife is a stay-at-home mom, stays in a HUGE bungalow, drives posh cars and bought my classmate a BMW convertible. When asked how, her excuse was that her dad is a good businessman. Yeah right! I guess this guy too is a "good" business man. The thing is, there are many police officers like my parents...and they KNOW ALL about officers like this guy and my classmate's date. The only problem is...how to prove? Dengan manusia boleh lah tipu, tapi dengan Tuhan, macamana? apa yg Rocky risau sangat kalau Ramli tak ada bukti kukuh ? Takut kerana salah, berani kerana benar. What about Abdullah Badawi children and son-in-law? I think we should include him also. And while at it I suggest to call upon KJ to conduct courses for new graduates on how to become filthy rich AFTER marrying a Prime Minister' daughter and live a life that one do not have to worry where you next meal is coming from for your future generations to come. Considering the damage done to the men in blue, since being a public servant and yet being able to amass so much wealth, its no wonder everyone seems to have an impression that every police officer from constable to the highest ranking are all corrupt. He should have beem brought to court to ascertain yhat all his wealth are legitimately accumulated. From his declaration it is obvious a few of the assets are underdeclared. A semi-d house in Tropicana indah were sold at time of launch for mu h higher than from what was declared. Anon 3.33pm hit the nail on the head: rocky, are you going to call for all public servants at high places to put this online as he has done? Salam Rocky.The crux of the matter is he was wrongly prosecuted.His procution was done malaciously.That is why his case was thrown out by the court. He loses his right to be considered for promotion to the highest post.His name was indeed tarnished by the legal process.As such he has every right to clear his name and put him back to the society. His right to be heard is guranteed by the constitution,as such let him has his day in the court of law. I wonder what happen to Ling liong Sik case,Sharizat Case,Perwaja case,Khir Toyol Case..... all not guilty. The issue here is simple: you take a civil servant's declaration, and you post it in public for all to see. This civil servant has already been vetted by the MACC and no action was taken, so why paste his details in public ? What about those who fail to declare their assets, including the cabinet members ? Why should ANYONE even bother to declare their assets if such a declaration can be used against you by unscrupulous bloggers with an axe to grind ? There is no confidentiality in this country if it does not involve UMNO - that's the real moral of this thread. aku rasa mamat anon 3.33 & 3.58 tu org yg sama. Sikit sikit kena fair, kena check yg belah sana lah and so on. Yg salah tetap salah... still try nak divert main issue dlam tajuk ni. aku pun tak suka jugak si polan yg mamat tu mentioned tapi jgn jadi anjing menyalak bukit. kalau bengang sangat kat si polan tu, cari bukti & siarkan. klu boleh saman terus.. aku pun akan sokong saman tu.. ini tidak,asyik nak merepek tak tentu hala..
jgn lah jadi bodoh piang..
Mengata orang dia yang lebih. Diorang ni macam gitulah. Spt Lim Guan Eng bertanya Zam, "Why does it always have to be about race?" padahal dia lah yang tak sudah2 bercakap pasal bangsa, cuma dia ni cerdik sikit - bila nak kutuk Melayu dia gunakan "Umno". I'm all for people in high public office to decclare their assets BUT that's another matter that even you and your masters can champion too. The issue at hand is this asset declaration made by Ramli Yusuf. With combined salary of just RM18k plus, he has managed to accumulate so much wealth. Fixed deposits alone exceed RM3.5 million. 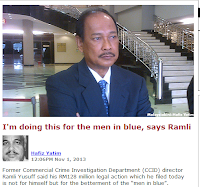 Ramli Yusuf claimed (in Din Merican's blog) that the IGP and the Home Minister had okayed his declaration of assets. Naturally, you'd have questions , 1. is it normal for a senior police officer to have so much wealth with so little? 2. if it's not normal, why did his IGP and Home Minister okayed his declaration? 3. what happened to the investigation that the ACA had launched? You and your masters have accused police officers of being corrupt. But when you see the facts and figures on those 12 pages, you say it's OK? Just because Ramli Yusuf is suing the government? Come off it, please! Not saying shouldnt question this fella and how he got his assets - by all means - BRING IT OUT and question him! dont spin it! issue is you seem to only question anyone that ruffles your boss's feathers. perhaps instead of projecting yourself as an impartial journalist, just declare openly where your loyalty lies (and for how much perhaps). A disclaimer of some sort. you have plenty of people who read your blog. use that influence to start demanding cabinet ministers declare their assets. nazri and family ? ah jib? khairy? yes? no? thought so. must be hard to point the pistol at your own bosses. Everybody make money from the stock market. This including MB,Ministers,Top Civil servants.and teacher . If you getbthe right tip,you can make million even if you plat contra T+4. Even your close friend like Kadir Jasin,Nazri Abdullah,Mutalib and Khalid make million of ringgit . Why raise this issue after 15 years. It is interesting to note where was Ramli when the super-bullish years of the IPO madness 1992-94 and what was his rank back then. From thar, you can work out backwards how much his pay and accumulated savings (Lets for arguments sake he is a very thrifty man). We need another assumption too. Ramli wasnt hit at all and complete spared when the Asian Financial Crisis of 1996-7 came and then KLSE crashdived from 1300 points to barely 260 points. Ramli must hv a bloody good crystal ball! (Mind you, there were very few ppl who can afford handsets (as I recall the popular term in the 90s). Especially not at a supritendant of police and later assistant commissioner of police pay. Probably it wise to compare the lifestyle of police officers in the cohort of Ramli, in the likes of Tan Srì Musa Hassan and Bakri Omar, who were his compemporaries if not bosses. Tell us, which JUSA C officer whose spouse isnt a successful entrepreneur back in 2007, could afford a RM1.1m condo in Pavilion, considering that he has a long list of other luxurious properties? Pls know that I am extremely proud of the honesty and integrity of your parents as polis. Pls convey my gratitude to them for serving the people in the way that they have. PDRM should have more personnel like your parents. Cinabeng tak payah kutuk melayu. Cinabeng tahu yang terpaksa kutuk ialah DUMNO. Cinabeng tahu bukan semua melayu sama dengan perangai Dumnoputra. "Tell me, Rocky, did the PM list his assets and those of his family members ? Did his son buy into listed companies ? Did Nor Yakcop declare his children's assets to allow his son to buy into a listed company ? How much are Shahreezat's children worth ? How much is Jamaluddin Jarjis' family worth ? People who live in glass houses should not throw stones." If we wanted to extend this line of enquiry to those in power, with equal rigour, Malaysia would need to build new prisons. DAP collaborating with PAS and PKR to win Sg Limau - ini kira "kutuk" melayu ke ? Lim Kit Siang menang Gelang Patah - dia tu "kutuk" melayu ke ? I know you are not racist, but you are toeing the UMNO line that if there is insufficient explanation, just turn to race and religion to distract the real issues at hand. I feel sad for you, Latuk. A cheap cigar and a swig of single malt, and you are ready to do the devil's bidding. Naik lah harga sikit. Rocky bro, please define filthy. Is Sharizat's family filthy ? Is Nor Yaacob's family filthy ? Is KJ's family filthy ? Is Najib's family filthy ? tolong sikit kasi definasi filthy. Trifling jester is spot on with his comments. "Mengata orang dia yang lebih. Diorang ni macam gitulah. Spt Lim Guan Eng bertanya Zam, "Why does it always have to be about race?" padahal dia lah yang tak sudah2 bercakap pasal bangsa, cuma dia ni cerdik sikit - bila nak kutuk Melayu dia gunakan "Umno". "Why (is Felda) not putting money into assets that are synergistic to its strengths in agribusiness?" In what way is this racist as a question? Zam's contorted logic is laughable. SPRM is not competent enough. For public servants or police officers it is clear. If your gaji is only 10,000 per month then 3.5 million is simply not possible unless you are corrupt. There is no need for proof for corruption laws. It is clear. Income that cannot be explained is corruption simple.